The geographic centre of Bhutan, Trongsa is a historical village built around a monastery that was established in 1543. 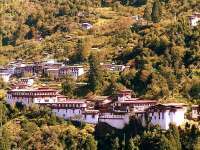 Small enough to easily explore on foot, Trongsa's main attractions include the Trongsa Dzong and the Thruepang Palace, as well as the markets in the centre of town that sell handmade textiles and traditional carpets for prices lower than those in Thimphu. Trongsa is a popular rest stop on the journey between Thimphu and Bumthang.